The Nepalese government is piloting agricultural projects that are described as taking a value chain approach to development. Although consumer value lies at the core of value chain management principles, none of these projects adopts a consumer perspective. This is an example of a more widespread gap in both the literature and practice as to how consumer perspectives can be used in the development of agrifood value chains in developing countries. 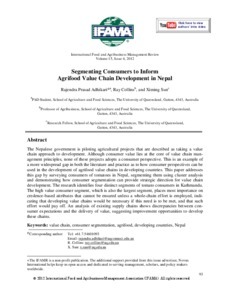 This paper addresses this gap by surveying consumers of tomatoes in Nepal, segmenting them using cluster analysis and demonstrating how consumer segmentation can provide strategic direction for value chain development. The research identifies four distinct segments of tomato consumers in Kathmandu. The high value consumer segment, which is also the largest segment, places most importance on credence-based attributes that cannot be ensured unless a whole-chain effort is employed, indicating that developing value chains would be necessary if this need is to be met, and that such effort would pay off. An analysis of existing supply chains shows discrepancies between consumer expectations and the delivery of value, suggesting improvement opportunities to develop these chains.